Lorri Holt as Colette in Zack Rogow and Lorri Holt's "Colette Uncensored"
Rosalinde Block, Writer/Performer/Visual Artist, "Drama of the Gifted Grownup"
Driving into Hollywood for the biggest meeting of his life, award-winning humorist & actor Dylan Brody remembers his boyhood in the downtrodden town of Schuylerville, New York, where he carried around Marvel comics tucked into Dostoevsky’s “Crime and Punishment” and was a regular visitor to the principal’s office for challenging his teachers’ assertions about the superiority of democracy and the underlying philosophies of second-grade hierarchies. Brody’s father, a professor at Skidmore College, also a regularly invited guest at the office at Schuylerville Central School, warned him that the American educational system was not his son’s responsibility to fix, but applauded him for trying. Witty, inventive, and always playful, Brody employs his signature structure of literary flashback and comedic callbacks to lead us through his absurdist childhood in a throwback town where the mayor begrudgingly acknowledged the family’s arrival by amending the sign at the town’s border to read: “Welcome to Schuylerville, Population 984… and some Jews,” to his early professional and artistic disappointments in the entertainment industry and on into his adult life as a comic and writer in Los Angeles. In a town where success and fame is constantly almost happening, Brody lifts our spirits and unites our common dreams in this very funny story of passion, heartbreak and a spark of hope at the intersection of art and commerce. 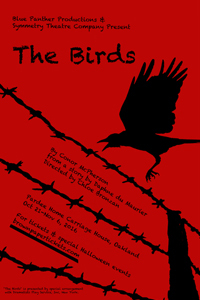 Blue Panther Productions in association with Symmetry Theatre Company presents the Bay Area Premiere of The Birds, Conor McPherson's adaptation of Daphne Du Maurier's classic thriller. Sara does a Solo is being celebrated on both sides of the border, called “soulful”, “urgent” and a “tour de force” by New York presenters. After 25 years writing on the works and lives of other artists, Porter turns her pen on herself to present a collision of dance, storytelling, poetry, stand-up, singing and visual design in an inter-play of fact and fiction, memoir and fantasy, confession and caricature. Sara does a Solo is a fearless account of aging and the reflective mind. Sara Porter's work has been supported by the Canada Council for the Arts, the Ontario Arts Council, The Toronto Arts Council, the Nova Scotia Talent Trust, and the Scottish Arts Council, as well as private donors. “Dinners With Augie” is the story of Arthur Valentine. After suffering a heart attack, Arthur must confront his own mortality. With the help of his doctor, Tom Mauro, and nurse Danielle Signorello, he makes an amazing discovery about life — the unshakable bonds between past and present.